The India Mobile Congress 2018, which concluded over the weekend, is South Asia’s biggest mobile, internet and tech event. The three-day India Mobile Congress 2018, which concluded over the weekend, threw up some nifty technological breakthroughs whose wider adoption will not just help the urban Amazon Prime addict, but also those in the rural hinterland without access to doctors. ThePrint brings you the 10 coolest technologies showcased at South Asia’s biggest mobile, internet, and tech event. A robotic arm conducting sonograms as a doctor miles away pulls the strings: This piece of science fiction could soon afford millions in rural India access to a healthy pregnancy where the development of a foetus can be constantly monitored. This demo was put on show at the booth put up by Reliance Jio, with Reliance Industries chairman Mukesh Ambani also stopping by for a peek. There was no doctor present at the booth, just a livestream showing one operating the robotic arm from a remote location. Jio collaborated with device-maker Huawei for the demonstration. Aiding the adoption of this technology will be high-speed internet courtesy of 5G connectivity, which is likely to hit Indian markets by 2020. Telecom operators expect the government to start the auction of 5G spectrum in 2019. Driver-less cars may sound like a bad idea for India, what with its famous disregard for the most basic rules, but what if they are the answer to instilling some discipline on Indian roads? 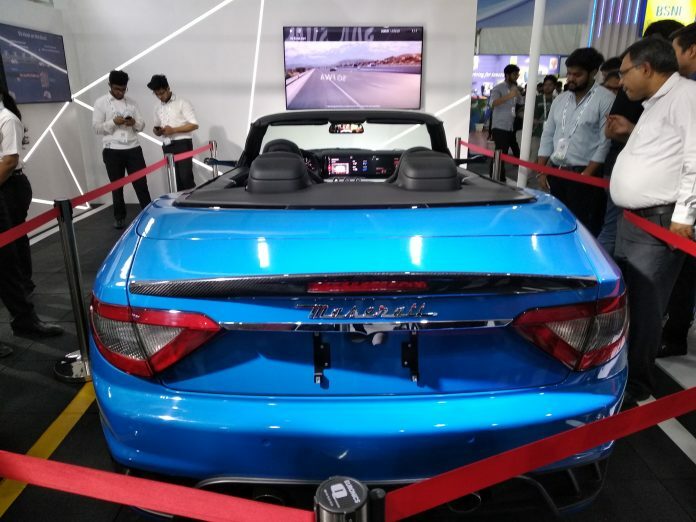 Among the technologies on display at the Reliance Jio booth was a driver-less car, with the demo video showing a person on the passenger seat of a vehicle being controlled by someone somewhere far, far away. IT major Ericsson and IIT-Delhi collaborated on the project. The cars are expected to be deployed by 2020 in specially designed passages like industrial zones, according to an official from Ericsson. Video calls are great to be in touch with our loved ones when they are a world away, but wouldn’t it be outright amazing if we could see them materialise by our side, whenever we so desired? Apparition is no longer restricted to the imagination of Harry Potter buffs, with scientists devising a close-enough variant with augmented reality. A demo at an Airtel booth included footage of two women sitting side by side, with spectators more than surprised to discover that one of them was but a projection of a woman actually seated in a distant studio. Used by Prime Minister Narendra Modi during his campaign for the Lok Sabha election in 2014, the hologram technology is being tested for wider adoption. However, it is unlikely to reach our devices soon. A facial recognition system showcased by Huawei could help police catch criminals at the speed of 5G. The system is equipped with a camera that can scan the faces of a crowd, and identify any mischief-maker with a record. The monitoring personnel can then access a connected database for all the information on file about the person in question. Already in use in countries like the UK and China, the technology can be deployed in India as early as next year, subject to the government’s nod. Telecom infrastructure maker Rosenberger showcased “leaky cables” and mobile signal “boosters” that can be fitted inside Metro train tunnels for seamless connectivity. The company has already secured approval to implement these equipments on Delhi Metro’s Magenta line, with work likely to begin in December. The company has already completed setting up the infrastructure across 23 Chennai Metro stations [with more stations to be covered], and claims to have received positive feedback. The world’s first 3D mobile phone that needs no special glasses is called VEECON ROKiT, manufactured by a joint venture between India’s Veecon Media and Broadcasting and US-based ROK Group of Companies. State-owned telco Bharat Sanchar Nigam Limited (BSNL) is the exclusive distribution partner for the phone. The phone is likely to be commercially available by the end of this year, when BSNL decides its cost, ROKiT officials said. There will be five models available — two feature phones, one entry-level smartphone and two hi-tech phones on a par with the big-ticket players, officials said. The phone is expected to hit the market with lower prices to carve a place for itself. A smartphone processor is the brain of the smartphone and controls all its vital functions. At the India Mobile Congress 2018, billion-dollar Taiwanese semiconductor manufacturer MediaTek showcased a processor that will support apps that employ advanced artificial intelligence, such as for real-time human pose recognition. This processor is called the Helios P70 and will be available to clients by November 2018. Chinese smartphone maker Realme has announced that it will be the first to launch, globally, a smartphone equipped with this new processor. Huawei presented a sophisticated dashboard that can be used to monitor an entire smart city, an important innovation for India as it eyes the development of tech-equipped efficient urban pockets. The dashboard shows a map of the city, the traffic on different routes, accidents as they happen, and establishments like schools, parks, and office buildings. It even includes an ‘economic index’ that shows the number of companies registered and de-registered. This technology will be a powerful tool in the hands of public and private agencies running these cities. Hao Zhichen, the president of Huawei Enterprises Business, said they had already delivered similar products to the authorities across India, with some still under development. Asked about the identity of the clients, he added that they were not authorised to name them as yet. Reliance Jio showcased a project still under development — a concept ‘Public Digital Centre’ meant to allow rural citizens access to a publicly available 3D printing machine to manufacture various products, say the spare parts of an engine or the rubber sole of a shoe, in a cost-effective manner, as well as medical check-ups by doctor present thousands of miles away.